According to ExpertPages.com “One of the most important purposes of cross-examination is to attempt to destroy the testimony and/or the credibility of the opponent’s witnesses.” In many cases the cross examiner tries to disparage the character of the witness in order to discount their testimony. And if a witness is unable to defend their personal character their testimony on a matter may be discounted. In a similar fashion, Satan will use the character of witnesses of Jesus Christ to discredit their testimony of Him among their peers. In order to prepare a witness for cross-examination a lawyer will challenge their own witness to ensure that their credibility is without reproach before allowing them to testify. 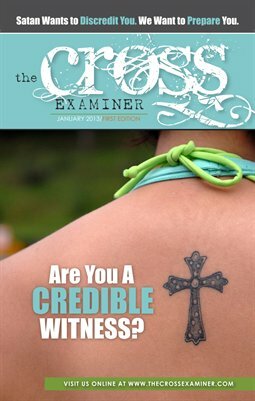 For clarification, The Cross Examiner Magazine is on your side. We want to not only challenge you as a believer of Jesus Christ but encourage and equip you to be a CREDIBLE witness for the Kingdom of God.